There's a revolution going on in marketing today. New technologies continue to emerge. Communication channels are shifting and fragmenting. New social media channels change the rules of marketing and customer engagement on a daily basis. Meanwhile, the pressure for marketing to deliver measurable ROI has never been higher. 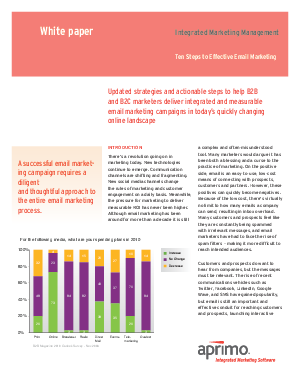 This white paper presents ten steps focused on updated strategies and actionable steps designed to help B2B and B2C marketers deliver integrated and measurable email marketing campaigns in today's quickly changing online landscape.